punishment for our sins and wrongs is paid for and then his righteousness is counted to us as ours. Jesus doesn’t just bring us back to a neutral position before God, dealing with our sins and then leaving us to our own righteousness. He clothes us in his righteousness, so when God looks at us he sees Jesus’ righteousness, not our own. In our culture there are myriad of ways we are told that we can come to and know God, we are surrounded by a multitude of religions offering ways to God, but the bible, reformers, and Articles of Religion teach that there is only one way to know God – through Jesus alone. In this short series of posts we have been showing how our Anglican doctrinal heritage gives us a wonderful expression of the Christian faith as it was re-discovered during the reformation. 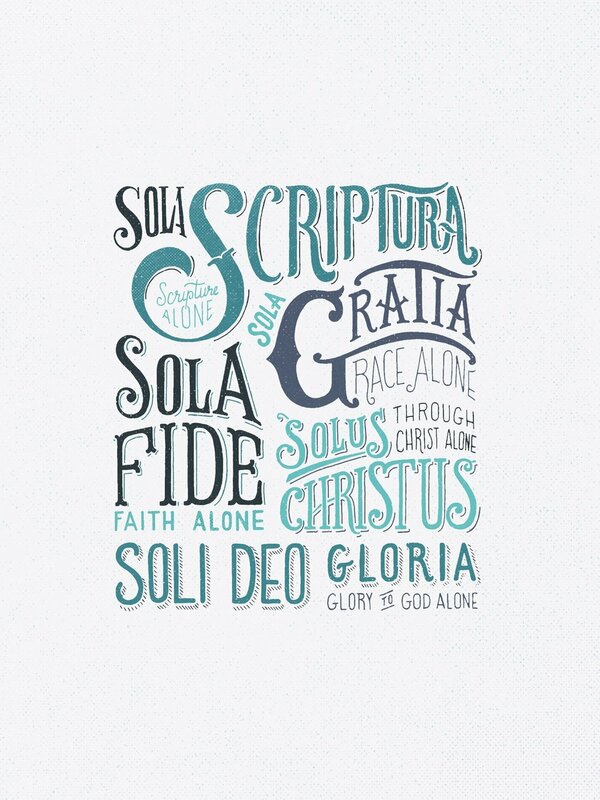 If 'Faith Alone' was the issue at the heart of the reformation, 'Scripture Alone' was the foundational issue. Where did Luther and others get their re-discovery of the gospel from? A fresh study of Scripture. On what basis did they dare to challenge the powerful church authorities of their day, overturning the traditions that had built up in recent centuries? On the basis of what God had said in the Scriptures, which, they insisted, is the only final authority for Christian belief and practice. Today we sometimes misinterpret 'Scripture Alone' to mean 'me and my bible on our own.' The Reformers would not have seen it that way. We benefit from the help of our Christian family in understanding the bible, both today and throughout history. But the Scriptures must rule supreme, and have the final say. As we come to think about being saved by grace alone you’ll realise how closely tied it is to last week’s post on being saved by faith alone; the two are indivisibly tied together. That we are saved by grace alone has some significant implications for how sure we can be of our salvation and how we think of ourselves. Firstly, a quote from Martin Luther summarising a little bit of what the Reformers thought about grace alone, and then a second quote from Article X from the Book of Common Prayer. The quote from Martin Luther reveals how significant our justification (God’s declaration that we are righteous) was for the reformers. Here he implies that it is one of the most significant things the separated them from the Roman Catholic church. The Article expands things a little more, notice they key ideas, that we can’t turn to God in faith by our own strength, nor can we do good works in our own power, it is God in his grace who must act and continues to act in our lives. The slightly strange phrase “without the grace of God by Christ preventing us” simply means without the God grace acting first, so that our will would be turned to him. The idea is that God must act in grace towards us before we can turn to him. This is the centre of the idea of justification by grace alone, that we are justified because God acts in grace before we have done, or desired to do, anything good in ourselves. It’s God’s unconditional grace, rooted in his love for his world, that has saved us. Paul explicitly says that it’s not of our works. The things we do, or don’t do, don’t contribute to our salvation, it’s something we have been freely given. Therefore, we don’t need to be seeking to judge our own lives or works to see whether they are good enough for God – because that’s not what God saves us based on. If we’re struggling with assurance that we’re one of God’s children we need to look back to God’s love for the world, so much that he gave up his Son, and remind ourselves that or salvation comes freely as a gift of grace, not based on what we’ve done. Secondly, notice that salvation by grace alone means that no-one has any grounds for boasting. Boasting points to yourself, it says “Look how good I am,” if our actions had some part in our salvation then we might find grounds for boasting in who we are or what we’ve done. But, as our salvation is based on God’s grace alone the only person we can point to and boast in is him. Salvation by grace alone is a great leveller, it puts us all as those who had nothing to offer God, but were saved by his grace anyway. As a church we describe ourselves as both Reformed and Anglican. As we celebrate the reformation over the next few weeks we’re going to run a series of blog posts seeing how these two aspects of our doctrine relate to one another and why it matters for us today. — Martin Luther, On Faith, And Coming To Christ. Salvation by faith alone underpins both the truths rediscovered in the Reformation and our Anglican doctrine. The emphasis is on the ‘aloneness’ of faith for justification, rather than it somehow being combined with what we do or deserve. Practically, whilst there being nothing we can do to influence our salvation can be a difficult pill to swallow – we always like to feel we’ve contributed or earned what we get – as article XI says it’s actually a real comfort. If we are justified by faith alone then nothing we do can make God consider us righteous, but also nothing we do makes God consider us unrighteous either. Salvation by faith also is full of comfort because it is based on Jesus’ righteousness rather than our own attempts at being righteous. And whereas our righteousness is always found wanting, Jesus’ righteousness is perfect, and by faith alone it is counted by God as our righteousness.